Get on. Plug in. Work out. Shapestream is an enabling solution to allow businesses to become Media Service Providers. Now your business can add value to your customer's experience and add a new revenue stream. 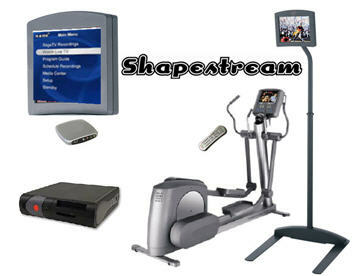 Shapestream enables your customers to shape their own media "stream". The Shapestream platform is customizable and easily extensible to allow an organization with several TV screens to become a media provider. That is, it allows your business to get into a secondary business -- one of a media aggregator, a local community builder, a reseller of content and advertiser. For a businesses that want to enable their customers to enjoy personalized entertainment experiences, Shapestream is superior solution that is advanced technically, reasonably priced and has excellent customer support. Shapestream is not just a TV/Internet/Radio station. Content will be made by everyone, in all niches. And it will be much cheaper than it is now. It will obey the rules of Chris Anderson's "The Long Tail". Shapestream is not just a hardware/software company. Both hardware and software is a commodity. You can buy a PVR from your cable company or electronics store. These systems are not intelligent. They create a " backlog" of content for you to watch. PVRs and media centres simply manage the risk of missing a TV show or movie. Shapestream has been installed on 2 treadmills at the Yorkville Club. Please visit the club at 87 Avenue Road to experience a new way to exercise. YorkvilleClub Members, please fill out the survey. We value your feedback. 1. Personalize to the theme and decor of your business location. 2. Extend the functionality of the system by adding modules that are relevant to your customer's experience. 3. Extend the reach of the media network to any other Personal Computer or Television for a very low cost (~$500/TV or PC). 4. Fully supported in Canada and US by an agile Canadian-based organization. 5. There are no long-term fees. If you decide to support your own device and continue to upgrade it, there are NO long term support costs for an Shapestream. You buy the device and have it installed -- that is all you ever have to pay. Why does business need a system like this? Timeshift any program so you can watch it when you want to watch it. Now or next year. Skip commercials from any pre-recorded content. Insert or replace your own local ads as necessary. Listen to playlists of customer defined music. Shape your information stream using advanced rules which manage music, video, news, Internet content with customer-provided input. My content my way. Each system can be defined with a set of favorite TV shows to record off the cable or satellite feed (HDTV is supported). Add your own custom content including pre-recorded video and audio content to the media stream. Once you or your customers try this new experience, they will not want to switch. You can charge a premium for the use of such a system, for example a higher tiered membership fee. What does my business need for setup? 3.Television(s) with 1 Video IN (RCA, S-Video, VGA or DVI connector) and Left+Right Audio IN jack or RF coaxial input. What makes it different? What does it look like? Why does my business need an entertainment system?